Mirror photo by Gary M. Baranec A part of Kenny Macklin has always wondered “what if” about Florida State’s potential in 1970. With March Madness in high gear, Kenny Macklin finds himself bittersweet. When the former Penn State Altoona head basketball coach and current Mountain Lion assistant was a player at Florida State in 1969-70, the Seminoles thought they had Final Four potential. In fact, they proved that, going 22-3 with their lone losses coming to North Carolina (with Charlie Scott), USC (with Paul Westphal) and Jacksonville (with Artis Gilmore). Jacksonville lost in the national championship to Bill Walton-led UCLA and finished the season 27-2. Jacksonville’s only other loss came to Florida State. But the best team in the Seminoles’ history wasn’t on the 1970 NCAA dance card because it was on probation after being told at midseason, when it was 11-2, that there would be no postseason. It was a minor enough violation that Hugh Durham, a former FSU player, would continue as head coach through 1978 before moving onto at Georgia for 17 seasons and eight more at Jacksonville en route to winning 634 games. He was inducted into the Basketball Hall of Fame in 2016. But his 1970 team, with Macklin as the starting point guard, paid a price that stings to this day. “There’s a part of me that says, ‘what if?’ when March Madness comes along, but I let it go,” he said. Florida State was led by Dave Cowens, who went on to NBA stardom with the Boston Celtics. Kareem Abdul-Jabbar (then Lew Alcindor) had just graduated from UCLA – obviously, this was well before the one-and-done rule – but the ‘Noles felt they could beat the Bruins. The team gathers in Tallahassee periodically, most recently this past January for a 50-year reunion, and was introduced during an FSU game. Of course, the subject of how well they would have done in the NCAA Tournament is bounced around, and the uncertainty is gnawing. “I would have rather played and lost (than been on probation),” Macklin said. All five starters averaged in double figures, including Macklin’s 10.9, en route to averaging 91.7 points per game, 10th in the country. But as notable as the FSU record, and probation, was the fact that the team broke a color barrier of sorts as Cowens was the only white starter. “Everywhere we go, they’re playing that Dixie song,” Macklin said of the racist lyrics. Angered by their NCAA plight that “ramped up our intensity” that included the mindset of “no layups,” the song and other slights pushed the players to take a stand. Or a seat. That was on top of having to be selective where the team ate and stayed. Macklin, now 70, said when he sees today’s young players overreacting, he thinks they could use a history lesson. Altoona coach Doug West wasn’t fully aware of Macklin’s experiences but has taken advantage of his colleague’s knowledge. A New Jersey native who played and later coached at East Orange, N.J. – which had a DePaul pipeline at one point, sending Clyde Bradshaw and Gary Garland (Whitney Houston’s brother) to the Blue Demons – Macklin grew up with the game transcending race. Though in a distinct minority at FSU – he often socialized at nearby Florida A&M, a black school – Macklin invited Cowens to his home in New Jersey for a couple weeks one summer. The two bonded and remain friends to this day. Cowens called Macklin “the glue” to the squad, which was nicknamed “Busted Flush” because it’s winning hand was broken by the NCAA. Despite the disappointment – “we didn’t get a chance to march through the madness,” Cowens said – the team stayed together, then and now. 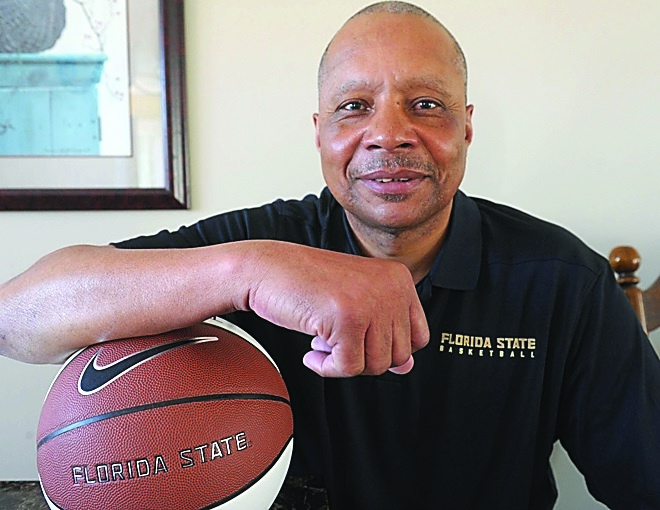 Macklin endured and enjoyed a circuitous 50-year basketball journey, from East Orange to the long bus trips of junior college ball in Kentucky to a scholarship at Florida State and to Europe briefly before landing in Altoona 30 years ago. As this year’s tourney unfolds and CBS eventually plays “One Shining Moment,” despite being left out of the 1970 bracket, Kenny Macklin feels he had his share of shining moments at Florida State.